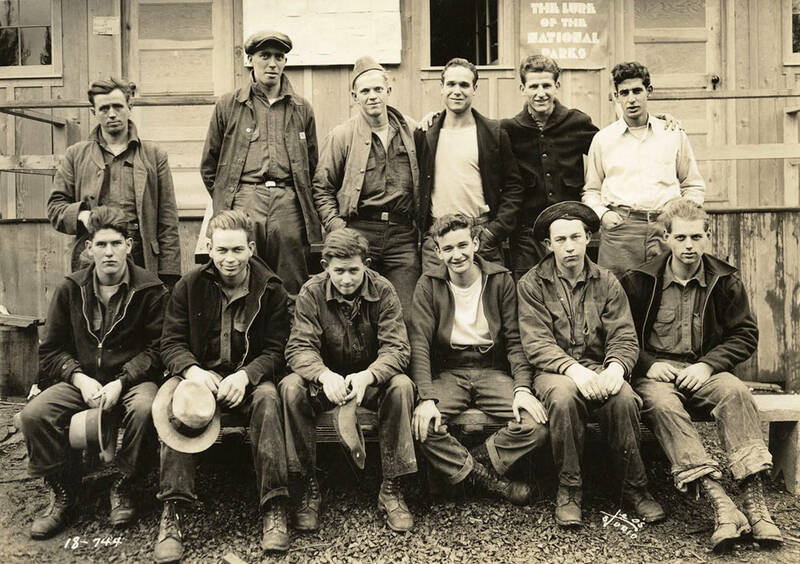 Group of CCC men posing for a photo outside one of the buildings at CCC Camp Heyburn, SP-1, Company 1995. Note the bulletin board on the side of the building behind the men. Poster reads: 'The Lure of the National Parks'. Back of photo reads: 'Heyburn'. In Copyright - Educational Use Permitted. Digital reproduction rights provided by the Museum of Arts and Crafts, Spokane. For more information, please contact University of Idaho Library Special Collections and Archives at libspec@uidaho.edu.